The Global Networking Experience, more commonly known as GNEX Conference, attracts more than 200 senior-level vacation industry executives, representing more than 125+ companies from around the world. Now in its 9th year, the conference is renowned for its heavy focus on networking that puts the acquisition of new business at the top of its priorities. Attendees are rewarded with unique session formats and interactive networking events that are created especially for the GNEX Conference, and unrivaled access to top-level executives that span all segments of the hotel and resort industry. GNEX 2019 has been confirmed for 24-27 February 2019 and will return to The Bahamas where the first event was held in 2011. 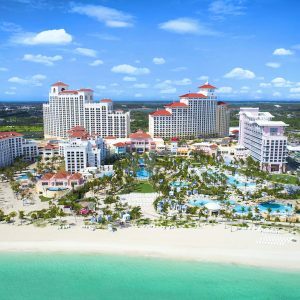 This time, however, the venue is the brand new $4.2 billion Baha Mar Resort on Nassau, set in 1,000 acres of luxurious beachfront resort which includes Grand Hyatt, SLS and Rosewood hotels, plus the largest casino in the Caribbean, 100,000 sq. ft. Convention Center, 30,000 sq. ft. Spa, stunning restaurants, luxury shopping and the Royal Blue Golf Course, designed by Jack Nicklaus. The extension that Mr. Mattimoe refers to is the addition of an optional Golf Tournament, plus an exciting experience day, where limited numbers of attendees can enjoy their own private island for the day, complete with famous swimming pigs, wild stingray feeding, meet the sharks, snorkeling and some planned networking activities ahead of the main conference. This gives attendees the option of extending the typical two-and-a-half-day format into four days of access to potential new business clients. The main two days of the conference will once again deliver a unique format, with innovative sessions designed specifically for GNEX Conferences and not seen anywhere else, bringing resort developers and vendors together like no other conference can. The popular 60-Second Pitch session and informative X-TALKS will be included in the schedule, along with new variations of the planned networking sessions and interesting guest speakers. Plus, nightly social events that will entertain and keep the conversations going.